Taking refuge in a remote island community, she cocoons herself in work, silence and solitude in a house by the sea. But she is haunted by her past, by memories and desires she'd hoped were long dead. Rose must decide whether she has in fact chosen a new life or just a different kind of death. Life and love are offered by new friends, her lonely daughter, and most of all Calum, a fragile younger man who has his own demons to exorcise. But does Rose, with her tenuous hold on life and sanity, have the courage to say yes to life and put her past behind her? 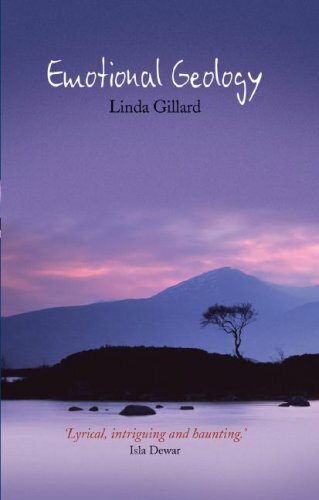 Emotional Geology by Linda Gillard is a sensitive and emotional read. It is about a forty seven years old lady, Rose and her tumultuous emotional journey and how she tries to recover from her past failed relationship with Gavin, an avid mountaineer and move on in life. Rose is a complex character and the author has very intricately described her, right from her love for her boyfriend-Gavin, the textile work she loves to do that works like a therapy to her, to her bipolar disorder sufferings, about her strained relationship with her daughter and lastly his attraction to Calum. The novel is not a very easy read. As Rose struggles with her life, the reader's heart aches to reach out to her, to help her heal. It is depressing and haunting at times as it explores issues such as mental illness, grief, regret, betrayal and heart break but it is redeeming at the end. The description of the landscape of Uist, Skye, and the tiny remote islands of western Scotland is given so vividly, that one will long to be in the place and soak oneself in its beauty. P.S: Thanks Lindy for recommending me Linda Gillard's work! I am so pleased that you are enjoying Linda Gillard's writing Jyoti and thanks for the link. Sounds like it's one of those stories that really pull you in and then stick with you after you've finished reading.